Do you ever feel lonely in your home, unaware as to why you always feel lazy or depressed? You may even have moments where you keep wondering why you don’t have more friends over or people to socialise with. There’s good news. In the most common case, it’s the clutter and the state of each room in your home that perhaps keeps a distance between you and other family members, friends or house mates you may have. It may be that you don’t notice people around you as much because of the seclusion you feel. Once your house reflects a happier and brighter image, however, you will also have much more confidence in showing your house, more thrive in inviting guests and a much more content outlook on your home. This may sound cliché, but removing the gunk, ensuring every surface is shiny and every room is filled with cold, fresh air can change you as a person. In fact, there is always the possibility of changing the layout of your bedroom or your living room, or both, once spring comes around. This enables the spring clean to have an even bigger impact on your day-to-day. The mind tends to fall into a routine after a long period of time, and creating this change can truly reawaken you. Moving furniture around could ensure that sunlight and air have much easier access inside your home. Stress and anxiety is much easier to release when you arrive home and there are no week-old dishes in the sink, or broken curtains that keep you from allowing the sun in, or so much dust over your white bookshelf that it looks grey. Coming back to a clear and tidy home encourages your mind to stay organised; charging you with energy. Keeping your house in an overall clean state is easy—vacuuming once a week and dusting the table when it’s time to eat. Throughout the year, however, we walk past those seemingly-clean rooms over and over again, making mental notes of what we need to do once we get to it properly. The national spring cleaning week will finally give you the opportunity to tick off that mental note. For that is what brings solace and liberation: the big sigh of relief once you’re finished. Throwing away old boxes, giving away clothes that are no longer needed, finally fixing that wardrobe that broke three months ago—all of it takes part in your eventual liberation. ​The process of cleaning itself is a great way of distressing and allowing yourself to remove focus from everything that may be taking over in that period of time. 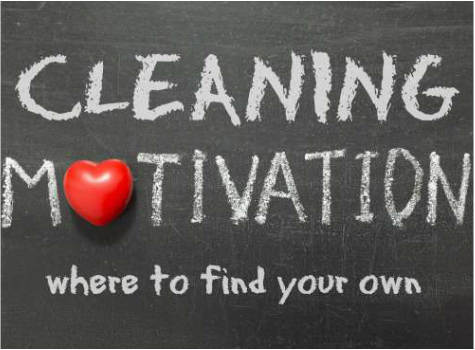 More importantly, the subconscious exercise that takes place when you clean helps release endorphins, therefore renewing your physical self by the end of the day. Spring cleaning for the whole week is a great asset to remember. There’s no reason to strain yourself and rush into finishing the entire house at once. If you use the entire week, you will clean much more diligently and have a little portion of exercise every day. ​Going through with the spring clean can give you the satisfaction and thrill of having achieved something. Some of us tend to be much harder on ourselves than needed. When we miss our deadline or not quite finish what we start, we immediately revert to feeling like we’ve failed. But there's no reason to feel that way about spring cleaning. This campaign is about finding the motivation and support in each other. It’s about getting friends and family together and transforming along with your home. So what are you waiting for? Get cleaning! If you still need some inspiration, check out these top spring cleaning tips.